In the Philippines, sinigang refers to any dish with sour broth. 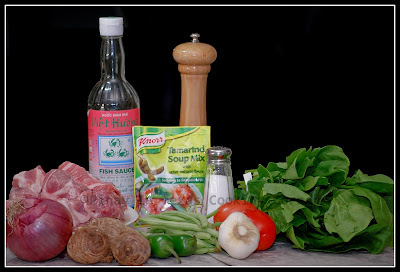 The most common variations of sinigang are pork, beef, fish and shrimp sinigang. There is also the chicken variation but it is most commonly called sinampalukang manok. Tamarind is the most popular and common souring ingredient but guavas, kamias, kalamansi and lemon can also be used. When cooking sinigang with pork or beef, you can use any cut you want but it’s better to add a cut with bones to add more flavor to the broth. There are also a lot of vegetables that you can use depending on the type of sinigang, including kangkong (water spinach), spinach, daikon (labanos), sitaw (string beans), green beans, talong (eggplants), okra and gabi (taro). Add all of them or some of them, it’s really up to you. 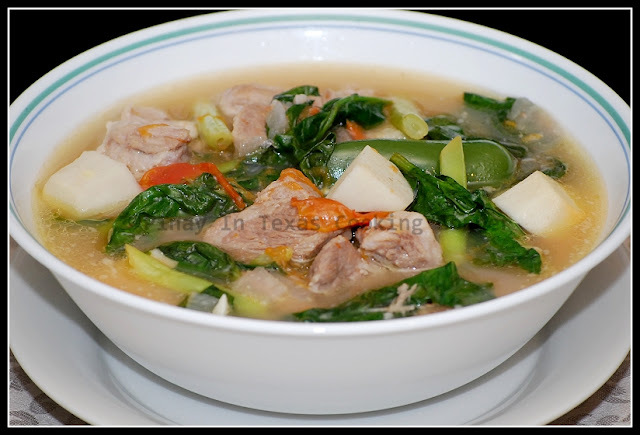 Today, I’m going to share with you sinigang na baboy (pork in sour broth) recipe. Because of the unavailability of fresh tamarind, I used Knorr Sinigang Mix. And for the vegetables, I used spinach, green beans and gabi. 1. Place pork in a dutch oven or large saucepan. Add enough water to cover the meat and bring to a boil over medium low heat until scum appears on the surface. Clear the scum off the broth. 2. Add garlic, onion, tomatoes, fish sauce and sinigang mix. Cover and simmer until pork is tender, approximately 1 hour. Test for tenderness. Remember that tenderness varies depending on the pork cut you’re using. Add more water if necessary, i.e., if they have to be cooked much longer. 3. Add gabi. When half cooked, add string or green beans and jalapeño. Simmer for 5 mins or until green beans are almost done. 4. Add salt to suit your taste. Add a pinch of black pepper. 5. Add spinach. Simmer for 3 more minutes. 6. Serve hot with rice! Ooh, that looks good! Thanks for the add on FoodBuzz! It's great to meet other bloggers! Thanks for dropping by Charissa! Have a good day! This looks delish!!! mmmm... now you have me craving soup! I've heard of " sinigang na lechon kawali". You, as an expert, what do you say? I'm thinking to cook it as potluck. This looks seriously appetizing! I haven't seen the Knorr pack mix here. Do I use the same ingredients and just add tamarind juice? Or do they have some extra spices in that packet mix? This is something I'm sure my family would love. Hi Ping! The tamarind mix has shrimp powder, tomato powder, onion powder & MSG in its ingredient list, but substituting it with plain tamarind juice will do. Tina, nag change ka na ba ng career? :-) i'll try your pork sinigang...looks yum!